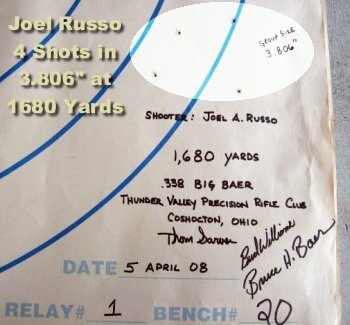 At Thunder Valley, Ohio, stockmaker Joel Russo recently shot an 0.44 MOA group at 1,680 yards (just 80 yards short of a mile), with four shots well under quarter-MOA (3.806″). Joel offers this report: “About two months ago, my good friend and custom rifle builder Bruce Baer, challenged me to shoot the Mile. I told him that if he builds the rifle, I’ll take him up on the challenge. I gave him a barrel that I had and then pestered him repeatedly for two months to chamber it. After he chambered the barreled action, I bedded it in the stock and completed load development under his guidance. The rifle is chambered as a .338 Big Baer, a .338-.408 Improved design by Baer. 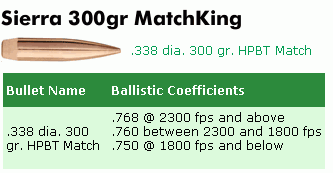 We load the 300gr .338 Sierra MatchKing bullet. The gun features a Lawton 8000 repeater action, Krieger barrel, Vais muzzle brake, Jewell trigger, Nightforce NXS 8-32×56 scope, NP1 reticle, and McMillan A-5 stock modified by Baer to accommodate the larger actions. The rifle weighs about 21 pounds. This weekend we made the trip to Thunder Valley in Kimbolton, Ohio. Thunder Valley is an IBS-sanctioned 1000-yard range. 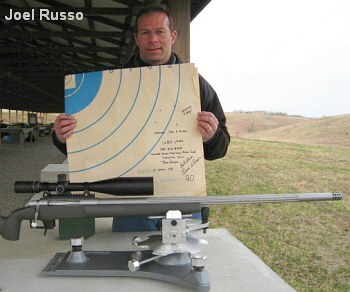 Range owner and rangemaster, Tom Sarver, also holds a ‘Mile Shoot’ in conjunction with the 1000-yard match. (The ‘Mile Shoot’ targets actually sit 80 yards shy of a mile, at 1680 yards.) Along for the trip was Bud Williams, Bruce Baer, and my father. Bruce and Bud both shot the ‘Mile’ at Thunder Valley two years ago. In 2006, Baer won group with 22.5″ and Williams won for score. This year, we shot 5-shot groups with a spotter only for sighter shots. No communication would be allowed between spotter and shooter during record fire. I shot the first relay with Baer as my spotter. First shot on cold clean barrel was center mass on the white sighter steel plate. Second shot was approx 17″ high but center mass. I made a correction and the next three shots were in the center of the plate. I immediately went to the record target. I fired five shots with no correction for conditions between shots. Sarver retrieved the target and told us that the fifth shot was 1.5″ right off the paper but in the group. He officially measured the 4-shot group at 3.806″. Estimate of the 5-shot group was 7.75″. One MOA at 1680 yards is 17.59″. Joel’s 4-shot cluster went into 0.216 MOA! Counting the fifth shot, the 5-shot group was 0.44 MOA — still remarkable shooting…. Share the post "Ultra-Long Range — 0.44 MOA at 1,680 Yards with a .338"
If you are a moly-coated bullet shooter, here’s a good deal on Berger Bullets offered by Lock, Stock & Barrel. LockStock.com has a wide selection of Berger moly bullets. These have been discontinued by Berger, so they are being offered at deep discounts, up to 23% off the regular price. The prices shown below are all for 100-count boxes, except the 17-Cal, 20-grainers, which are packed 200 to a box. 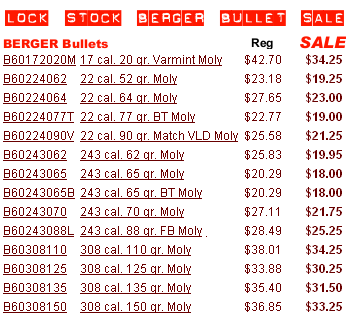 Share the post "Berger Moly Bullet Sale at LockStock.com"